There were plenty of Babyologists in awe of Korean artist Shawn Soh’s tree bookcase and now it’s available through Nurseryworks! We discovered the original Shawn Soh tree bookcase back in 2009 and instantly fell in love, but it proved no easy task to ship one from Korea. We hope there’s better luck with the Nurseryworks version! The Nurseryworks Tree Bookcase blends effortlessly with existing Nurseryworks furniture and gives an instant wow factor to any room. Who doesn’t love it when something practical is equally beautiful? Available in high gloss forest green or white and made from sturdy MDF, the tree bookcase can be mounted to a wall to securely hold more than one hundred of your child’s favourite books. That’s a whole lot of reading! 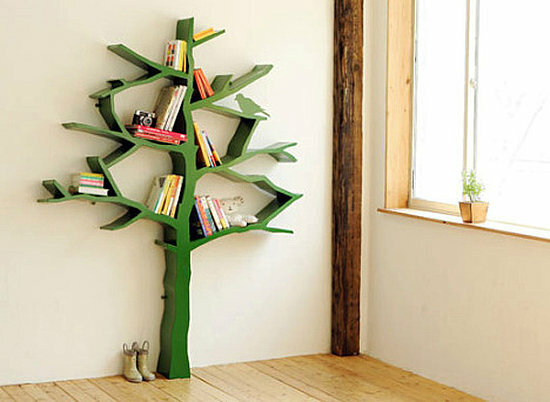 The Nurseryworks Tree Bookcase will set you back US$850. Contact Nurseryworks direct to ask about international shipping.